Pork pochero is one of the variations of beef or chicken pochero and it is one of the popular Filipino tomato based meat stew. Usually when we make pork pochero we use pork tenderloin which I think is more healthier than pork belly but it is more pleasing and tasty because of the tasty tender pork fat of the pork belly. It is also cheaper than tenderloin. Also, most of the recipes I saw online uses garbanzos or chick peas but this version, which I think is more traditional used white beans, which are sold dried and you have to soak it in water overnight before cooking. I think there is a simpler way of preparing white beans, I think canned pork and beans will do the trick. But since it is already cooked, you have to add it when the pochero is almost cooked and all the ingredients are already combined. 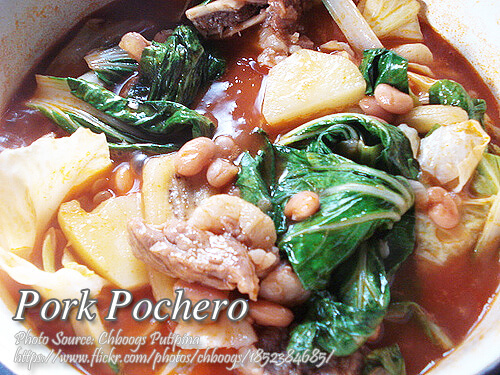 To cook pork pochero; In a medium size pan, saute garlic and onions until fragrant. Then add the pork belly and stir fry for about 3 minutes or until the pork sizzles. Then add the patis and tomato sauce. Stir for a few minutes then add the 3 cups of water, white beans and peppercorns. Bring to a boil then simmer for 20 to 30 minutes or until the pork and the white beans are tender. Remove the floating scum and add more water if the soup stock is drying up. When pork is tender, add in the potatoes and cook for 3 minutes more or until the potatoes are tender. Then add in the green beans, cabbage and saba bananas and cook for 3 to 5 minutes more. To see the complete recipe, continue reading below. Pork pochero is one of the variations of beef or chicken pochero and it is one of the popular Filipino tomato based meat stew. In a medium size pan, saute garlic and onions until fragrant. Then add the pork belly and stir fry for about 3 minutes or until the pork sizzles. Then add the patis and tomato sauce. Stir for a few minutes then add the 3 cups of water, white beans and peppercorns. Bring to a boil then simmer for 20 to 30 minutes or until the pork and the white beans are tender. Remove the floating scum and add more water if the soup stock is drying up. When pork is tender, add in the potatoes and cook for 3 minutes more or until the potatoes are tender. Then add in the green beans, cabbage, pechay and saba bananas and cook for 3 to 5 minutes more. Adjust the seasoning and add more salt if necessary. Serve hot.